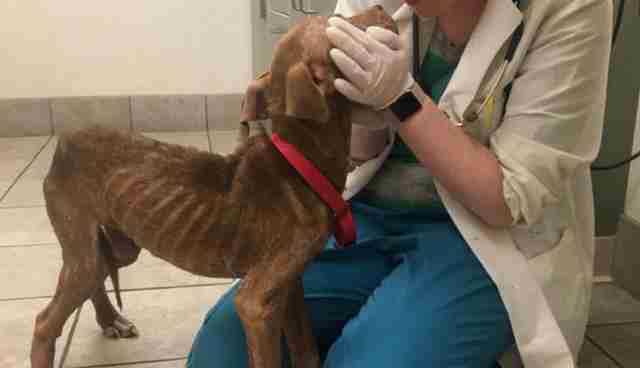 Horrible mistreatment and neglect left this puppy's body so thin and frail that he nearly lost his life - but through it all, he clearly never lost his spirit. 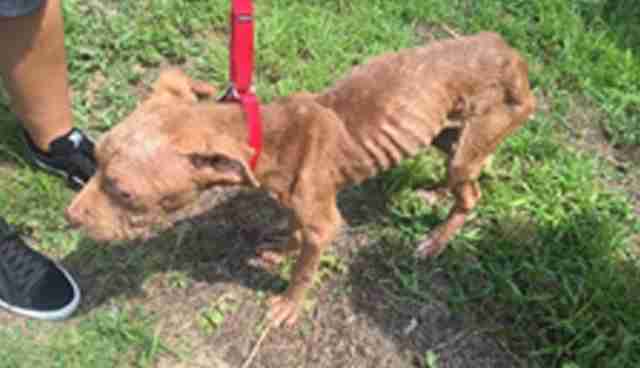 Last Sunday, animal control officers in Patterson, New Jersey, were alerted to the young dog's plight after neighbors complained that his owner was keeping him alone outside with no food or water. 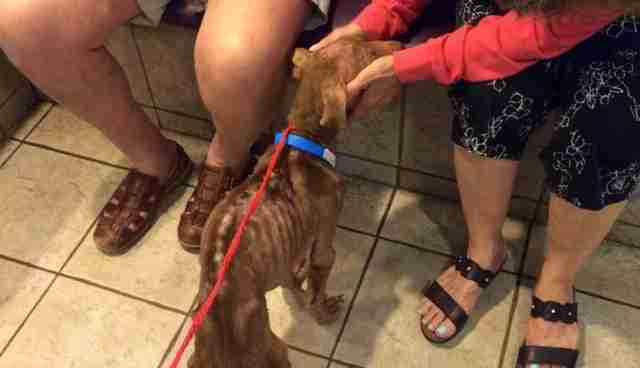 "A skeleton of a puppy wagged his emaciated body as they approached," the Ramapo-Bergen Animal Refuge wrote online. "He then collapsed from the exertion and excitement of greeting a visitor, having been alone for days." 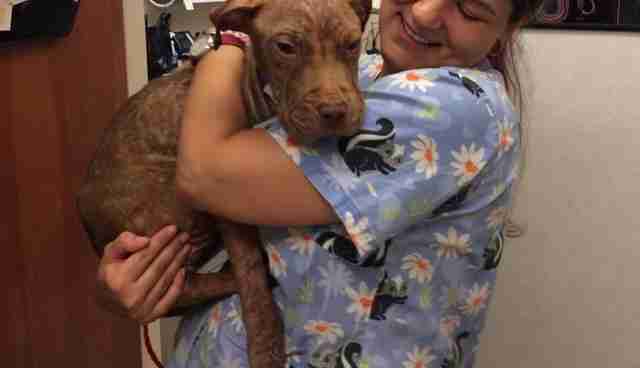 Fearing for the puppy's health, both due to malnutrition and a skin condition, the officers then wrapped him up in a towel and carried him to get treatment at the Oradell Animal Hospital. On the way, the pup - who they named Pax - showered them with affection, perhaps out of gratitude for ending his sad ordeal. 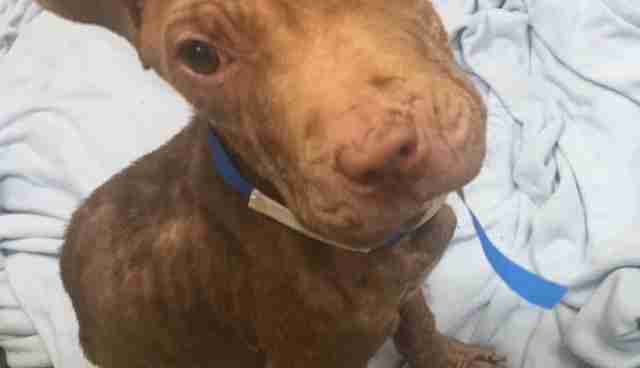 "They almost forgot how sick he was because his frail body was hidden by the comfy towel and he never stopped kissing them," the shelter wrote. "When they arrived and unwrapped him, he began wiggling again. He was so happy, his tail wagging furiously - all the while the rescuers were in tears as he tipped over again and again from weakness [...]"
Pax remained at the clinic for two days, where he began to recover his strength, and charm the staff with his sweet, gentle nature. In fact, when it was time for him to leave, placed under the care of the Ramapo-Bergen Animal Refuge, Pax couldn't help but stop to greet everyone he passed by on his way out. It's been less than a week now since his rescue, but Pax has already gained two pounds. And while he still has a long road ahead of him before he's fully recovered, it's not something he's having to face alone. More than 150 people so far have donated to a GoFundMe page launched to help cover Pax's medical bills, raising over $6,000 in a matter of days. When the time comes, Pax will be placed for adoption to live out his life as a cherished pet in a forever home. In the meantime, however, he is basking in the care and affection he'd once been cruelly denied. "This very special puppy has won the hearts of everyone who meets him," writes the shelter. "He's got a long way to go, but his spirit is strong, and he's very loved. "